For six hundred turns Pern lived without the threat of thread thanks to AIVAS's work. No longer did dragons and their riders have to risk their lives to keep home and hold safe. They gladly settled into their new role in the world. As the turns passed, it was only the tales of their past heroics that kept the weyrs supplied with enough candidates and food to care for the dragons. And while the weyrs struggled, new advancements were made both in medicine and technology. Surgeries that would have killed before now became plausible, steam-powered fire lizards became the pets of Lord and Lady Holders. It was not long after a failed test with a steam powered airship that things began to change. It started first with a simple hatching. Once a moment of joy for those who would impress, hatchings became nothing short of a nightmare for all. It started with one hatchling attacking another, and then the hatchlings began attacking the candidates themselves. The incident was not an isolated one. Over and over the grisly scene played itself out in the weyrs until becoming a candidate was thought of as little more than a death sentence. The stories that had sheltered the weyrs for so long were no longer enough, and the people of Pern, frightened by what was happening, turned away from them. Pern, it seemed, would never wake up from this nightmare. The violence, once restrained to hatchling dragons, spread through the ranks of the elder dragons. Soon dragons were not only attacking each other but even their own riders. If there was one silver lining to be found, it was that the afflicted dragons would die no more than a month after their symptoms appeared. After three maddening, bloody months, the last dragon falls, the final victim to the ‘Plague of Madness’. All of Pern waits in fear of the next wave of bloodshed, but it never comes. The horrible fate of the dragons seemed to pass over the smaller creatures, leaving the whers and firelizards untouched. As the turns passed, everyone began to believe the nightmare had finally ended. Some people mourned the loss of the dragons while there were those that chose to forget them, the memory of their loss too great. But many chose to remember the dragons as they were before they vanished, vicious creatures that only wished to spill their blood. Such dark thoughts pervaded the Pernese conscious for hundreds of turns. Two hundred turns after the dragons vanish the unthinkable happens as Thread begins to fall. Whers and firelizards struggled to protect the world just as the dragons had done before them, but at the end of the fifty turn long Pass Pern’s new protectors had nearly wiped themselves out with the effort. Another two hundred turns passed and their numbers had yet to recover. Just as many believe their world will fall into darkness once more a light of hope shines upon them. As the Lord Holders prepare to announce the grim news, a great golden beast appears in the sky flanked by six hundred dragons ready to protect a world that thought them gone. Both hope and fear fill the people of Pern, but before anyone can decide which they they dared trust, the Queen vanished, leaving behind fifty dragons and their riders as well as a precious gift. A clutch of twenty-nine eggs donated to the newly formed Aterrima Weyr, one holding the coveted golden Queen. The search for Candidates began in earnest, and willing or not the young men and women of Pern were conscripted to Stand. And Stand they did. All of Aterrima bore witness as the first strange hatchling, a gold and purple male like a richly colored sunset, stepped onto the Sands. And all of Aterrima bore witness as Kaltith appeared once more and sought to destroy it. Golden Rimeth saved her Topaz brother, and in the process died. Kaltith would have crushed the rest even then, but the dragons of Aterrima rose against her at Rimeth's last command. Remember Rimeth, and protect my siblings. Weyrleader S'zar intends to do just that and much, much more. An original plot and setting with many opportunities for characters of all kinds! Opportunities for characters of any gender to rise to any rank! 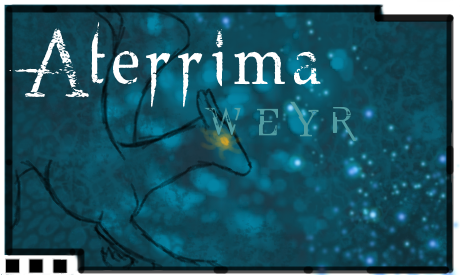 Five non-canon colors have been introduced with Aterrima's first hatching. Non sexuality based impression. Female riders may ride everything but bronze. Ranking positions are currently available among dragonriders and the holds. A post AIVAS setting with some steam-driven technology and more advanced medical care. An open, sandbox world in which members drive the story.